Finally we get a proper winter’s day. The Atlantic lows, which have been waltzing around one another for weeks, drenching sky and earth, have gone, leaving the air dry and cold and clear. We make the short climb to the summit of Chapel Carn Brea, the most westerly of mainland hills. This is our fourth visit in as many weeks, in search of perfect viewing conditions. The Isles of Scilly are my gauge. If I reach the summit and the Isles are a dark smudge on the horizon, my heart sinks a little bit. But today the Isles shine and hover in the middle distance, dominating the view to the south west. Local lore has it that Chapel Carn Brea has the widest sea panorama of any mainland hill in the country. Local lore does not specify England, the United Kingdom, or Cornwall. Whatever the truth, the view contains a lot of sea, from Lizard Point, the most southerly bit of mainland Britain, across Mount’s Bay and the shipping lanes of the western Channel, past the Wolf Rock lighthouse, Longships, Scilly, Shark’s Fin, the Seven Stones lightship, The Brisons, to Cape Cornwall. Beyond which the sea is squeezed between the horizon and the land until it peters out on the lower slopes of Carn Kenidjack. I am standing at the highest point of the hill, on a huge jumbled mound of stones, the remains of a series of barrows built and rebuilt over millennia to house the dead. A prehistoric trackway, known as the Old Land’s End Road, skirts the southern edge of the hill. It links Maen Castle with the ancient trading port of St Michael’s Mount, and would once have been a busy thoroughfare. I wonder how many other people have stood on this spot over the centuries, looking out across the water and past the Isles, watching for the right conditions to make the crossing. 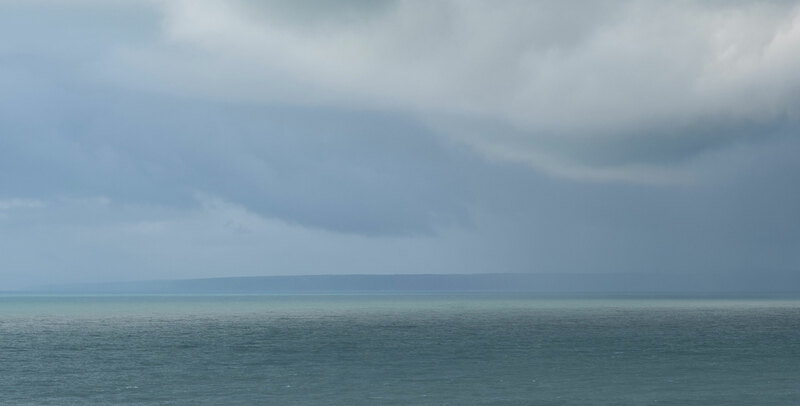 A solid lid of cloud covers earth and sea, except at the horizon, where a continuous strip of pale blue sky merges with the shifting grey-green-blue of the ocean. It’s just past noon and the position of the weak winter sun is only detectable because the clouds in the southern quarter are slightly brighter. Here and there shafts of angled light break through the cloud, creating small silver pools on the face of the restless sea. One appears around the Wolf Rock ten miles out, making the lighthouse appear close and important. To the south-east Porthleven suddenly emerges from the dark backdrop of the long Lizard peninsula, like an actor stepping into the spotlight to the applause of the crowd. When I look back at the Wolf the silver light has gone and the lighthouse looks small, and lonely. On our way home from Penzance we return to the hill. The late afternoon sun is low in the south-west. Pale silver has been replaced by pale gold, a fair exchange I think as I gaze at the gilded Isles. Beyond Scilly a solid wall of cloud rises from the sea. The next Atlantic low is coming in.